How big of a tile would you like to have in your home? You may never say those words out loud but you probably have thought something like that when you are thinking of remodeling or building your new home. The hundred dollar wet saw you were looking at buying to do the project yourself can cut tile but how large of a tile can it handle? Probably not that big of a tile. Maybe you can hire someone to install it instead and use the bigger tile instead of installing it yourself, or you can rent a big wet saw instead of buying one. did go much larger than that. A twenty four inch by forty eight inch tile. If your regular ceramic and porcelain tile are roughly the same thickness why not mix the two together? Just adding accents or inserts of stone into a ceramic and porcelain tile can add a little bit more depth and movement into a plain floor. It can also help tie everything together and give your home a more designer look. A nice tile pattern can do the same thing rather than the traditional straight lay or diagonal floor you see so much of. 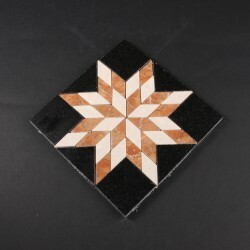 And even if you are, or if you want we can, just cutting down a stone to a like a 4×4 and inserting it every 20 or so tiles the look of your home can be truly unique. If you are going with stone instead of tile instead of cutting up tile to insert into your stone floor a contrasting stone would look just perfect.